Made by Ernabella Arts Inc, c. 2005. This batik comes from an exhibtion held at the Fabric of Life in South Australia. The exhibition was the result of works made as part of a collaboration between Ernabella Arts Inc and Brahma Tirta Sari. The batik is mainly red and orange with abstract designs in white. Designed and made by Yilpi Adamson, as part of collaborative works by Ernabella Arts Inc and Brahma Tirta Sari, in Pukatja, South Australia, c. 2005. The batik is based on design elements from Yilpi's land and her stories. Ernabella Arts is thought to be the longest continually running Aboriginal art centre in Australia and 1998 was the year of its 50th anniversary. The craft room was set up at the end of 1948 to provide employment for Pitjantjatjara and Yankunytjatjara women by applying their spinning skills to the wool from the sheep run on the Mission station. The traditional spindle has since been adopted as the logo for what was to become Ernabella Arts Incorporated. From this beginning women and girls have produced art in many different media all incorporating the distinctive Ernabella design. Woven woollen scarves and knee rugs, knotted floor rugs, moccasins and bags were made for many years. Ernabella is also known for its printmaking on paper, paintings on canvas and Belgian Linen and silk painting. 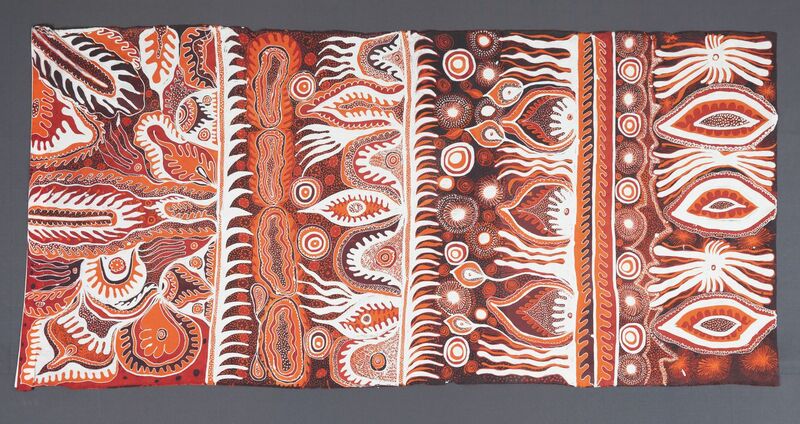 Of the contemporary art forms of Central Australia, the fabric traditions of Ernabella have gained a unique reputation in Australia and overseas. Batik has been synonymous with Ernabella since the mid-70's and the resultant silks feature in many national and international exhibitions. Ernabella is represented in all the major state galleries and museums, other major public and private collections in Australia and overseas and our work has been featured in a number of recently published works on Aboriginal Art.